I sat in the hotel lobby area sipping on my morning coffee, watching the beautiful, golden, early morning light pour in through the glass doors just a half dozen yards in front of me when I noticed him slowly shuffling into the lobby with his walker in the lead. The white hair left on his head trimmed short, once tall, he was now slightly hunched over, the crease from his oxygen line permanently imprinting his face during his sleep, he moved slowly forward. Carefully, he grabbed a complimentary newspaper from the front desk, and setting it on the seat of his walker, for what I assumed was easy transport, he began heading over to sit at the table in front of me. Sitting carefully down, he opened the newspaper and began to read it. Newspaper. “Huh, those still exist?” I thought to myself as I tried to focus on my plans for the day. It was my vacation and the possibilities were endless. It was all going to be about me for the first time in a very long time. So, God, what should I do today? My eyes focused on the man in front of me again and the thought pressed in, why don’t you offer to serve him? “Seriously?” I mouthed silently. Slowly, carefully, not unlike the older man in front of me, I got up and walked over to him. “May I get you a cup of coffee?” I asked. His smile, big and warm, and inviting. “Oh, wow. I wish I could give it up, but this mama needs caffeine. Can I do anything else for you?” I asked, trying to avoid thinking about how awkward I felt. As his eyes grew misty, so did mine. I promised I would while wondering if this bartender was really going to bake this guy a cake. What sort of bartender does that anyway? With a chuckle she looked at me and said, “Oh! You mean Sam. Yeah, great guy! He loves carrot cake with cream cheese icing so I baked one up for him last night. Today is his birthday!” My shoulders sagged as I realized she even knew his name and it hadn’t even crossed my mind to ask. I had no words, so I sat and sipped on my beverage and waited. A few minutes later here came Sam rounding the corner into the lobby area and heading straight to the bar. I didn’t hear their words, but I watched. After greeting him and pouring him a drink she left to head into the kitchen area. 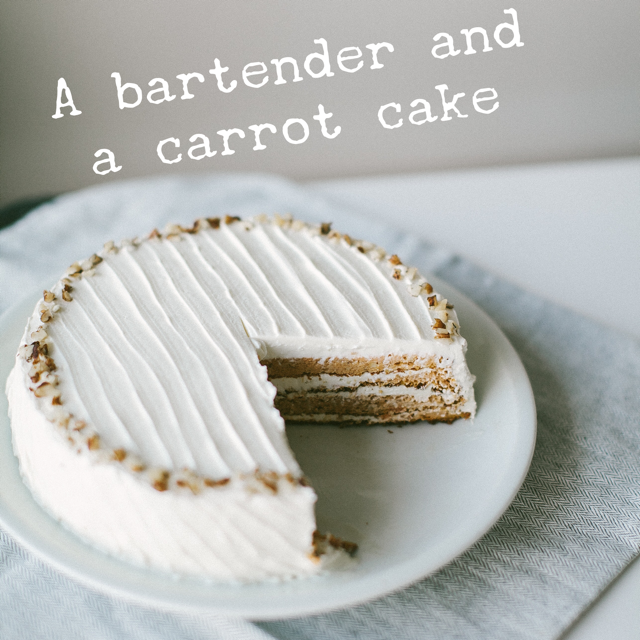 A few moments later she came out with a humble, but delicious looking carrot cake covered with a liberal amount of cream cheese frosting. As she set it before him with a huge smile on her face I watched as his face lit up too. I was watching a scene I knew Heaven was applauding. Humbled, I walked over and asked if I could take a photo for them to remember the moment, and carefully he handed me his cell phone. It was the best sermon I have seen in a long time.